How can a story be only for a girl, or a sticker be just for a boy? 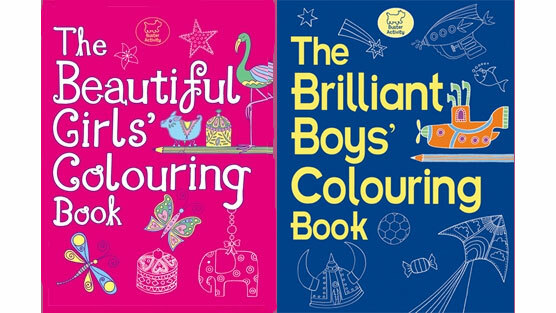 But titles like ‘The Beautiful Girls’ Book of Colouring’ or ‘Illustrated Classics for Boys’ are on the shelves in toyshops, bookstores and supermarkets around the UK and Ireland. These books send out very limiting messages to children about what kinds of things are appropriate for girls or for boys. Blue covers, with themes of action and adventure, robots, space, trucks and pirates contrast with a riot of pink sparkles, fairies, princesses, flowers and butterflies. But real children’s interests are a lot more diverse, and more interesting, than that. Children are listening, and take seriously the messages they receive from books, from toys, from marketing and the adults around them. Do we really want them to believe that certain things are off-limits for them because of their gender? They’re not ‘getting it wrong’ if a girl likes robots, or if a boy wants to doodle flowers. These artificial boundaries turn children away from their true preferences, and provide a fertile ground for bullying. Just like labelling toys for girls or boys, we think these book titles are limiting and restrictive. It’s time that publishers Let Books Be Books and leave children free to choose their interests for themselves. Great extension of the campaign. My 4yo daughter loves Usborne’s sticker books, but it makes me wince to see them separated by gender. First, why can’t the books portray mixed sexes? The “girls” career book was admirably diverse in the jobs it showed women doing – but why not just have a book showing people of both sexes doing those jobs? The extreme sports one (the one my daughter chose) has a couple of women in – but is squarely placed in the boys selection. It’s inexcusable. I’m really pleased to see this extension to the campaign too. My daughter shouldn’t have to have put stickers over ‘girls’ and written ‘anyone who likes cooking’ over it, as she did to an Usborne recipe book. Really support your Let toys be toys campaign, delighted to see this extension. It’s time we made gendered books a historical oddity. As a Mum to two daughters (3 and 5) who love stories about dogs, princesses, pirates, anything Julia Donaldson (loved by both girls and boys) and who are passionate about funny stories regardless of whether they’ve got pink or blue covers, plus director of a boutique book PR agency (Literally PR) I fully support this campaign. I shall support further by sharing the link and encouraging as many people as possible to discover more about it, consider which books they buy for the little boy or girl in their lives, and authors to consider whether they are biased in gender when writing and designing the layout of their latest story. Usborne books are a big player with an appallingly gender bias. As mentioned before their sticker books are particularly bad, though one new series within that is a vast improvements. My daughter, who loves history, much prefers the subjects in the Boys sticker dressing books. The girls ones are almost all the same, about shopping, and fashion and frankly pretty dire. She was devastated when she looked at buying the Roman one (and not the only girl I’ve met to feel the same). NOT A SINGLE FEMALE figure to dress up. A whole cultural period of history with the women completely removed. An imbalance in male and female figures is understandable in the ones focusing on traditionally male aspects of history – pirates (though this has some decent female figures), soldiers etc, but removing half the population of an entire culture is frankly appalling. Usborne’s answer was a pathetic – boys won’t buy sticker books with girls in. But surprisingly enough my daughter also didn’t buy a sticker book she was really looking forward to either, and hasn’t bought one since. I’ve just emailed Ladybird and The Book People about ‘Pirate Pete Potty’ which I bought recently for my pirate loving two and a half year old. When the book arrived I was surprised to see ‘Potty training for boys’ on the cover. I wondered if this was to do with specific potty activity relating to the male physique however a review of the book shows there is nothing related to male genitalia in it. It would appear that someone decided that pirates are just for boys which is a shame for my pirate loving little girl. I guess she is ‘supposed’ to be all about the incredibly pink ‘Princess Polly’ book. Unfortunately, The Book People responded by saying that it is all about the publisher and nothing to do with the stock they choose to carry, which they have no control over. An odd response, one which is firstly quite clearly inaccurate and secondly is quite obviously a fob-off. It’s a shame from a company that up till now I thought was great. Ladybird have yet to respond. Let Books Be Books - where's the harm?